One of the questions I get the most from service based business owners is, how do I price my services? 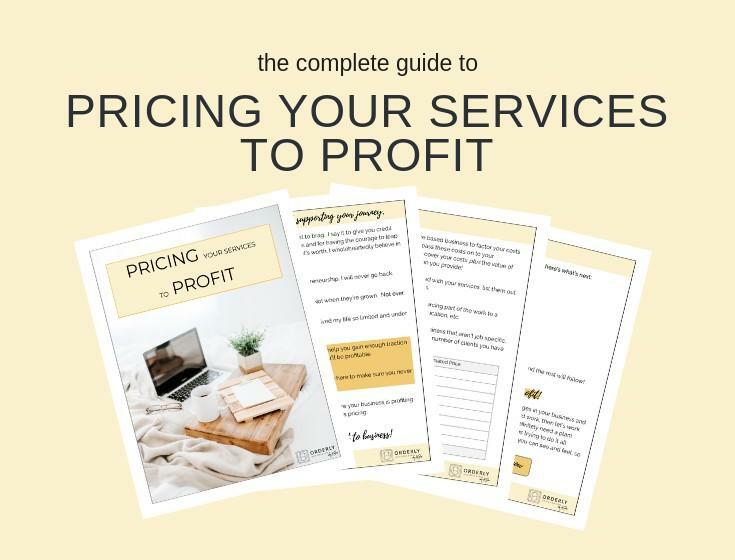 This is such an important topic that I wanted to dive in deep and cover the 4 things you should consider when pricing your services. They are: (1) the value you provide your clients, (2) your time, (3) your costs, and (4) what you're giving up. Now let's dive into those each a bit more. 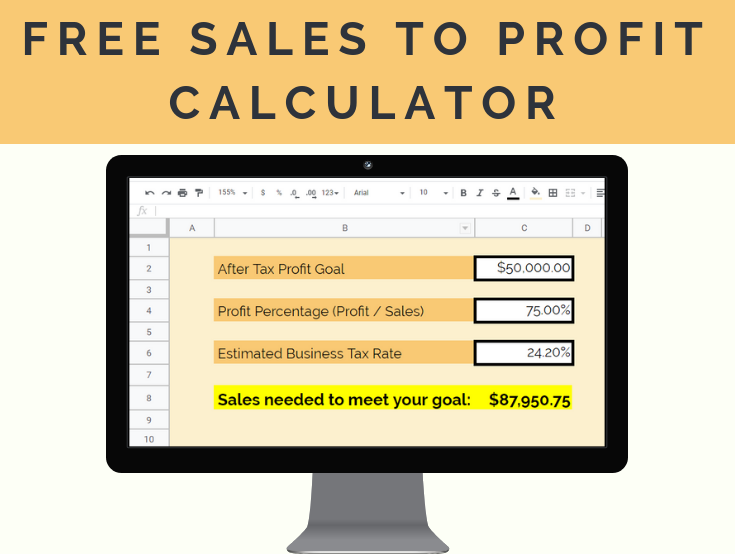 Make sure you grab my FREE Sales to Profit calculator that will calculate the sales you need to meet your after-tax profit goals without doing any math at all! #1 Thing to Consider When Pricing Your Services: The value you provide. 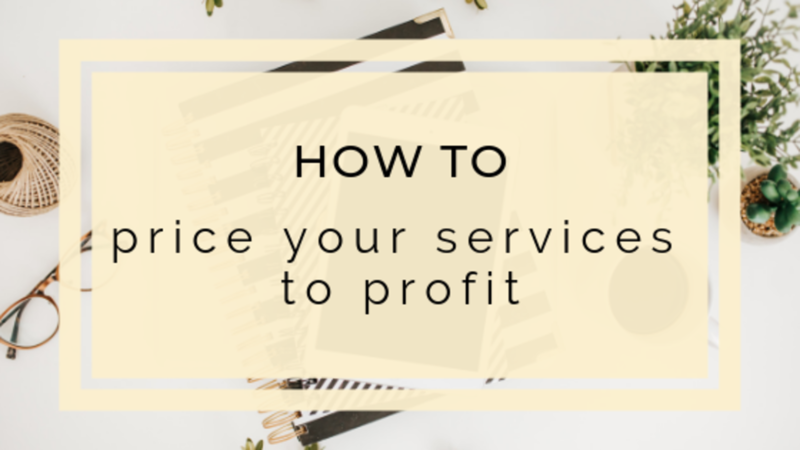 The first thing that you should focus on when pricing your services, and by far the most important, is the value that you provide your clients. You should not be thinking about the time or cost first because what your client is paying you for is a service that they value that they either can’t do or would rather not do themselves. One way that you can increase prices is to increase your value or perceived. What I have done in my bookkeeping business is increased my prices by adding value to my clients. That value comes either in giving lifetime access to our recorded trainings, having quarterly meetings where we review their numbers, and providing monthly reports and recaps of ways they can increase their profits. I make sure to work behind the scenes and communicate concisely so that they feel they are doing very little work and mostly I relieve a burden from them and allow them more time to focus on their income producing activities or the parts of their business they are passionate about. In your business how you add value may be different but think about what your customer is experiencing working with you and know that they are paying you mostly for the transformation and peace of mind that you are giving them. Even if it only takes you an hour to complete a task, you don't need to limit that to $20 an hour, you can charge a premium price if the value is great enough. If you are saving someone from doing 10 hours of work themselves and getting frustrated, your value is great than the time it takes for you to complete a task, especially once you become an expert in your area from years of experience. But remember, don't lead with your experience, lead with the transformation the client will receive. People are most interested in what they will experience working with you, and not your work history. The second thing that you should consider when pricing your services is the time it takes you to complete the job. You have to know, or track, the amount of time that it takes you to complete a task for your client and make sure that you are pricing it appropriately to profit. Sometimes in the beginning of your business it may take you longer to complete tasks if you're experiencing a learning curve. If that’s the case for you right now, then you can be a bit more flexible, knowing that it will get faster for you in the long run. But overall you need to be tracking your time because if you’re charging $60 for a service that is taking you 12 hours to complete, then you have an unsustainable business model because no one can work for $5 an hour and stay in business long term. Depending on what services you provide, tracking your time may be simple or it might be tricky. If you work a little here or there on a project over the course of a month, you’ll have to create a log or system of recording your time so you can make sure your prices reflect the time it takes you. One thing to pay attention to is the back and forth that you have communicating with clients. If you are spending a lot of time just communicating needs or changes, you have to build that into the cost. This may be something you don’t anticipate, but you should be aware of it and realize that even if it’s a quick response from your phone here and there, if this is the norm in your industry, you’ll find yourself a slave to your phone as your business grows and you may need to either increase prices to accommodate the time or create boundaries for streamlined communication. It should go without saying that you need to pay attention to the costs associated with offering your service. Even service based industries have costs associated with doing business. In my business, I have to pay for software, bank fees, computer programs, and continuing education, and I have to make sure those costs are being paid by my customers or built in to the cost. Be aware of what a job costs you, and pass it on to the customer, the same way a contractor would hand you a receipt to reimburse him for materials when doing a job on your home. Not in the exact same manner, but build it in to your price. For example, if each year you pay $500 for your website, $200 for education, and $400 for software throughout the year and you have roughly 20 clients, you should build up your cost by roughly $55 per year per client. If you bill monthly, you could increase your bill by about $5 a month to cover these costs. I got $55 by adding up the yearly costs and dividing by 20 clients. ($500 + $200 + $400) / 20 = $55. Then I got $5 per month by diving $55 by 12 which gave me $4 and change so I rounded up. This one is huge. You have to be super aware of what you're giving up when you're working for a client. Is it time with your family? Is it the ability to work on your passion? 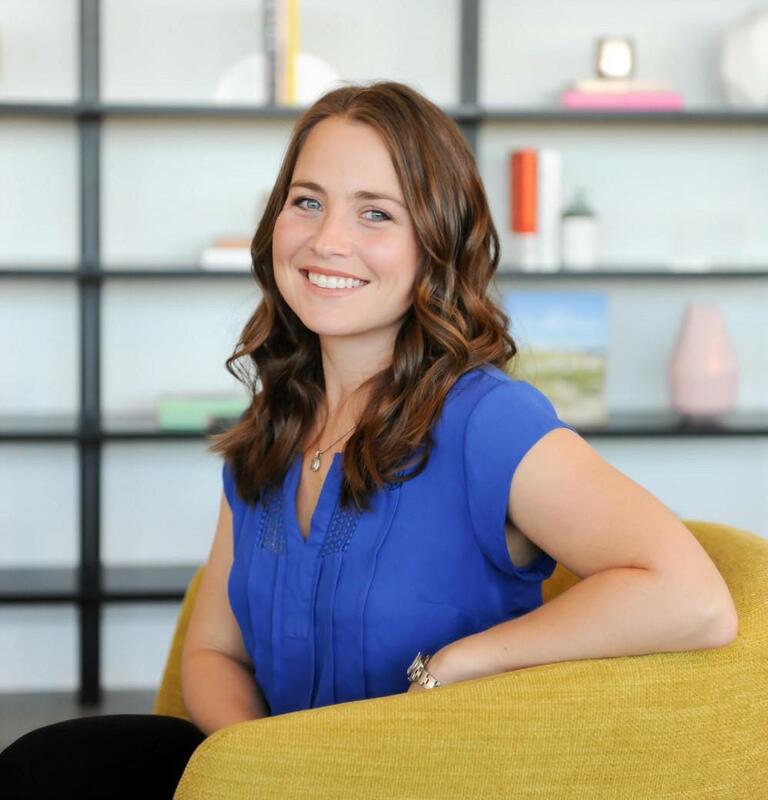 Is it preventing you from working on a client who values you more? I've recently gotten to the point in my business where I realize that not everyone is going to think that my services are worth what I think they're worth. But a massive part in being an entrepreneur is understanding your own worth and not negotiating it to the point of compromising your success. You don't have to be a jerk about it, but if you are talking to a potential new client and you can tell that they don't see the value in the service that you provide then it might be best to part ways before you ever begin working together. That way you allow a space to find a client who values you, respects you, and understands your worth. This will be beneficial in the long run even if you turn away customers because you are leaving space for better ones. When you raise your prices you will get fewer people to come on board. But what would it look like if you could work with half the amount of clients and earn the same amount of money? How would you be able to show up better and serve those ideal clients who value you? How much better would you feel in order to reach higher levels of success? As your business grows and your expertise grows your prices should increase as well and sometimes you will outgrow your customers and that's okay. When you start raising prices you may start repelling people. The key is to properly communicate the benefit they will receive and leave them open to come on board and experience the transformation with you. Reaching a place in my business where I can be selective with my clients has been a game changer for me. Put this info into action! The best place to start is by getting your FREE Sales to Profit calculator that will calculate the sales you need to meet your after-tax profit goals so you have a goal to reach and can develop a strategy to get there instead of just hoping for the best. If you want $50,000 at the end of the year to pay your bills, pay off debt and save for your future, you need a lot more than $50,000 in sales! Find out what that number is for you and I'll help you on your journey to making it happen!